In retrospect, I knew it was going to hurt. Months of preparation and training had proven to be painful, even excruciating at times. But at mile 10, on the big day, I thought my legs might detach themselves from my body and jump into the nearest ditch. Luckily, by mile 11, they went numb, which proved to be the age-old dichotomy of a blessing and a curse. It helped the pain threshold, but made it difficult to keep my legs moving. I’ve never been an inherently athletic person, so how I found myself tackling the immense task of running 13.1 miles is still perplexing to me. My life has always yoyo-ed back and forth between healthy habits and ice cream; working out and Netflix. Life is too busy, I’ve told myself repetitively. I don’t have time to be one of those crazy runners. When I graduated and got my first job, I started working out with a coworker, which was great motivation to stay healthy. 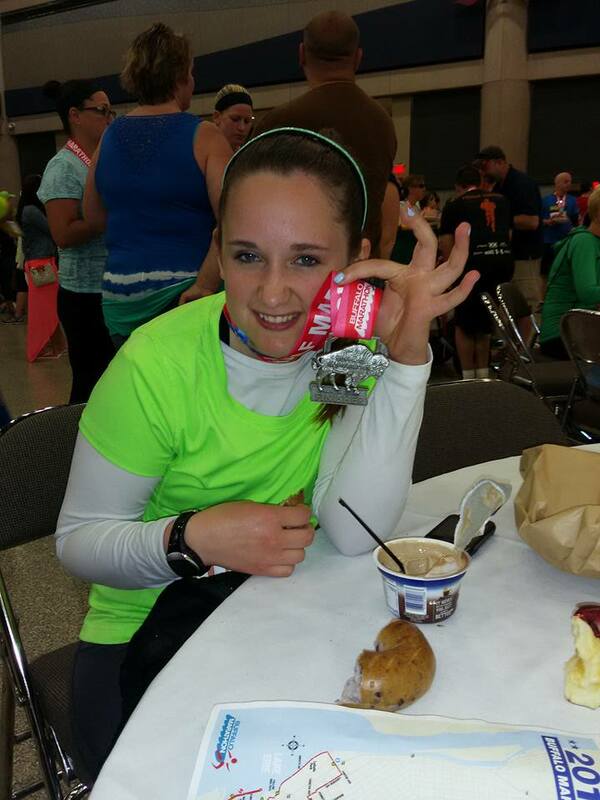 I completed a few 5k races—the fun ones, of course—then endeavored to train for my first 8k. At the time, the idea of running five miles terrified me, and I had absolutely no idea how to train for it. I started running three or four days a week with no schedule, and I wasn’t tracking my mileage. At the start line of the LockRock 8k, my mind raced with doubts, and I knew I had underprepared. Did I finish?—yes. Was it pretty?—no. Coming across the finish line, I kept booking it pass the spectators and found the biggest tree I could find. By the time I was done with it, its fine bark was coated in that morning’s breakfast special. Talk about embarrassing. Half of me was proud that I at least finished; the other half wanted to limp as far away as I could and never come back; to ram my head into the ground and live in the hole that it created. It wasn’t until I found myself wandering aimlessly through an ocean of spectators that I became infatuated with running. 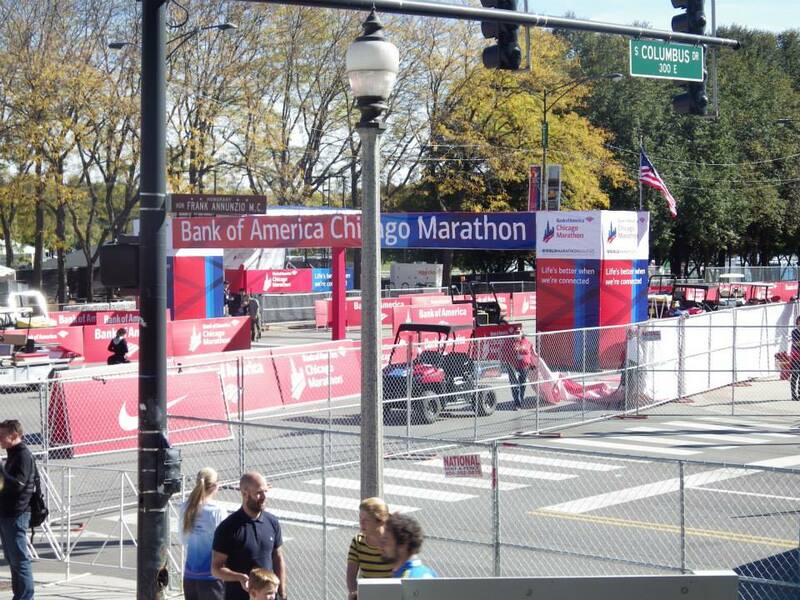 One of my friends from college moved to Chicago for law school, and while taking in the sites of the city, we got swept up by the Chicago Marathon. Thousands of people flocked to the course with shouts of encouragement on their lips; they were alive with excitement and their hands clasped signs that declared: You are unstoppable! Or Run like you stole it! The energy intoxicated me; the shouts were hypnotizing. But nothing made me fall in love quite as much as the expressions on the faces of the runners. Their faces contorted from ecstasy to fatigue to pain and back again, but each runner moved forward, regardless. When they crossed the finish line, some of them collapsed into the arms of their loved ones; some fell straight to the ground; and others reached desperately for water and food. Regardless of their reactions, all of them seemed divine at that finish line, their faces placid with the knowledge that they completed a feat most would never dream of in their lifetimes. To me, it seemed like a grand metaphor for life, a testament to human resilience—to be able to push yourself toward your goal when every muscle in your body begs you to stop, to be able to keep moving forward when your face so clearly screams with exhaustion—that is what being alive is all about! In that moment, I vowed to be one of them: exhausted with triumph, too depleted for negativity. 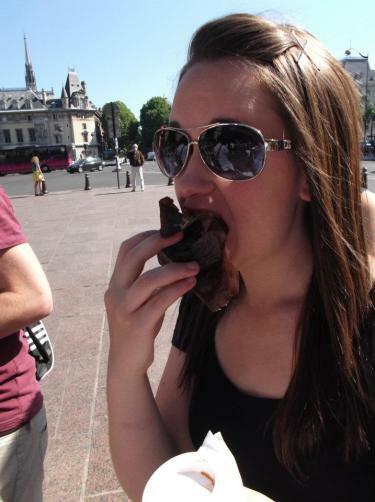 I was going to run a half marathon. So, I started training. Slowly, of course. Progress was grueling: three, four, five miles, always intermingled with short stretches of walking. 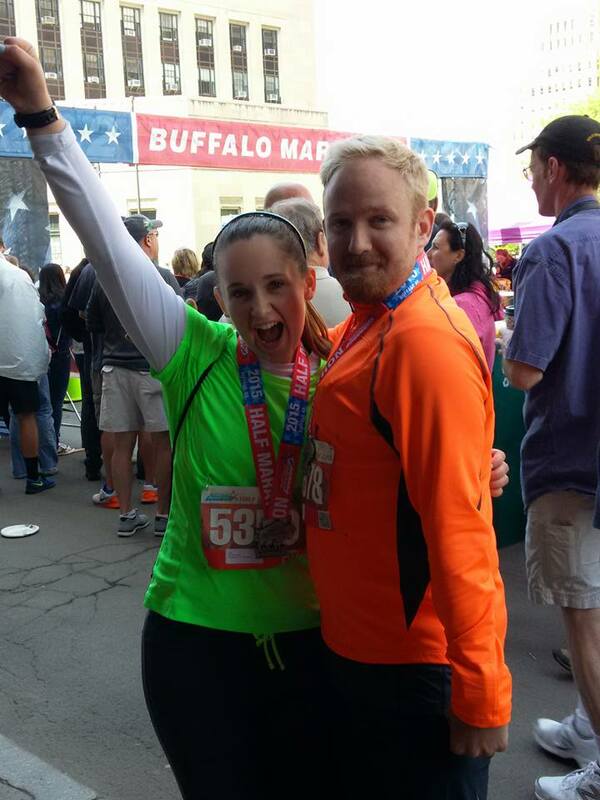 When I gained a bit of confidence, I started telling people about my plan, including my college friend, Dave, who not only encouraged me and gave me advice on the training process, but vowed to run it with me—even though he lives in Syracuse. With newfound resolve, my excuses became fewer, and my runs became longer. I woke up early on Sundays for long runs, and started needing to walk less. I explored new trails and quickly learned each and every five-mile path from my house. Doubts still weighed on me, though: Could I really do it? My training schedule was always behind, and I was nursing some pretty serious blisters that set me back in my training. Dave always swiftly shut each concern down, and eventually, I made it to ten miles, though it wasn’t the prettiest ten miles I’ve ever covered—the last few miles were still littered with stretches of walking and a whole lot of sweat. Leading up to race day, I read articles on techniques you can use while running distances and came across one that suggested I focus on something different in each mile to break up the run. So I took this idea and shaped it into a game to motivate myself. For each mile, I vowed to dedicate the run to someone I cared about. I needed thirteen point one reasons to run this race, so I found them. On the big day, I found myself scrambling to use the port-a-potty twenty minutes before the race, and the line was backed up for nearly a quarter mile. By the time I finished, I was scrambling to find Dave near the 10-minute-mile marker and was terrified that I would be running the race alone. Whereas the boisterous voices at the Chicago Marathon had energized me, the chatter at the Buffalo Marathon made my nerves stand on end—there were so many people. Luckily, Dave’s bright orange hoodie eventually caught my attention, and when the sign was given, we were off to a crawl, hindered both by the crowd, and my own fear of running out of energy early on in the race. Finally, we fell into a rhythm, and I let my game begin. Mile one was dedicated to my grandmother, a fiercely stubborn and relentless woman who recently had her leg amputated and was bound to a wheelchair. As my feet pattered over the pavement, a memory came to mind of a trip my family had taken with her years back when I was a teenager. At the time, she had been using a cane to help with her balance, and my parent and I were going to play tennis. She hobbled along with us, and we snapped a picture of her gripping a tennis racquet in one hand and waving her cane in the air with her other. That picture found its way into one of my photo albums at home, and what stands out most is not the absurdness of her playing tennis with a cane, but, rather, the joy in her face that testifies that the woman never let life’s limitation keep her down. As I rounded up that first mile, I knew that she would love to be in my shoes. I dedicated mile two to my other grandmother who struggles daily with early-onset Alzheimer’s. Despite her confusion and lack of short-term memory, she still holds fast to cherished memories that happened over fifty years ago that have shaped her into a spunky, lively, and strong woman. I dedicated mile three to both of my parents, whose unwavering support brought me to the realization of so many of my dreams. Mile four was dedicated to my best friend, and sister; mile five to my brother. At mile six, I thought it fitting to dedicate my run to my grandfather, a Korean War veteran. It was after all, Memorial Day weekend. Each subsequent mile followed suit, with a dedication to someone who helped lead me to where I am today. My most important mile, mile 13, I saved for someone truly dear to my heart: my grandpa Mozer, who died in September 2001. I still remember all of the stories he told about snow-shoeing through Alaska with his pack of dogs and about great battles he valiantly won against strangers. He was the reason I fell in love with storytelling, and his memory gave me fuel in my last full mile. It also planted a seed for one of my next races, where I will dedicate the whole 13.1 to him and my best friend’s father, who both lost their battles with cancer. (If you would like to donate to my Team Cure Challenge, you can find my page at: http://teamcurechallenge2015.kintera.org/faf/donorReg/donorPledge.asp?ievent=1136332&supid=423748822. Every little bit helps and is greatly appreciated!). The final .1 of the race, I had to dedicate to Dave, for all of his support and encouragement, and for helping me achieve more than I ever thought possible of myself and my body. There were times when I wanted to quit, but he never let me. The entire trek was made possible—and much more pleasant—by Dave’s words of encouragement. I was kicked at mile 10, but somehow, I kept moving forward. The signs along the trail helped. When someone tells you: You Look So Skinny Right Now! or My parents are doing this, and they’re old!, you tend to find motivate to push yourself even more. 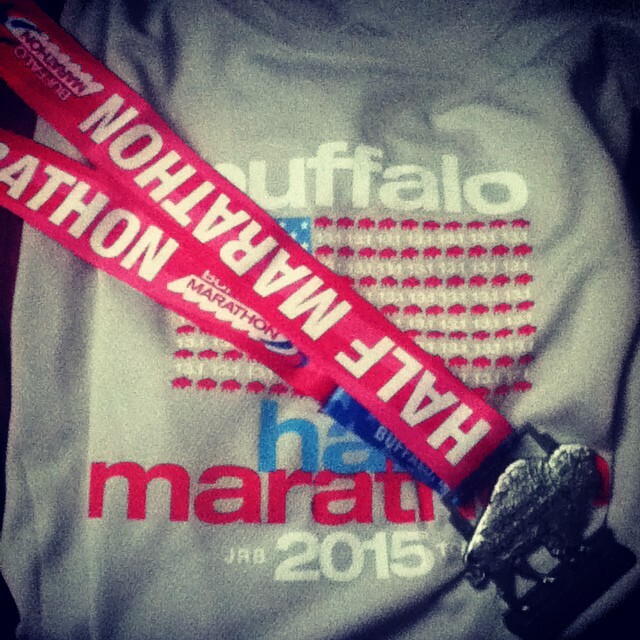 When I saw the finish line, I found strength in myself to haul as fast as I could across the finish line. As my feet halted to a stop at the end of course, my exhaustion was replaced by disbelief and pride. When they placed the finisher’s medal over my head, it wasn’t the feat itself that I was most proud of: it was the thought of the people in my life who transformed me into who I am today. It is because of them that I have the strength to wake up each day and work toward my goals. I’ve never felt more fortunate or blessed than I did at that finish line. And that, dear readers, is why I run: because when life threatens to buckle underneath you, you need to learn to spring back up and book it to the finish line, especially when it hurts the most. Also, the cool finisher’s medal helps a lot.